What a stunningly beautiful picture. And edible, no less. (Is ALL of it edible?) I'm beginning to realize how much I've underestimated seeds. The leaves and flowers of nasties are both edible--and both are quite pretty in a salad. In this case, since I have just the single blossom, I'm going to watch it carefully for seed formation, then preserve that little puppy for next year. 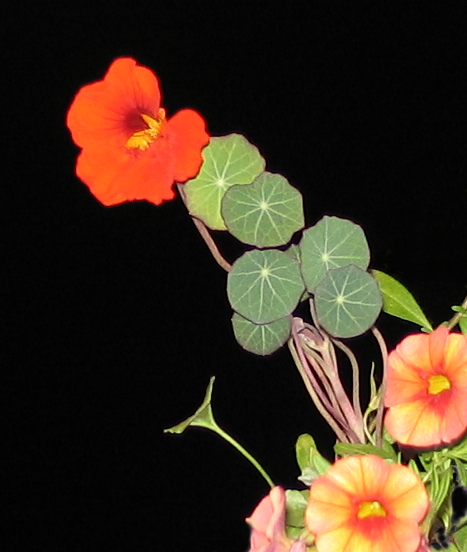 In a couple of years, I might with luck be able to share this particularly beautiful old-fashioned dark orange nasturtium with fellow gardeners. I'm especially partial to the bluish cast of the leaves.